La Grande Tartarie - SANSON,N. Title : La Grande Tartarie. Size : 7.5 x 9.8 inches. / 19.0 x 25.0 cm. Description :Attractive map of Siberia, northern China, and Korea, which is shown here as an island. The cities, mountains, forests and rivers are well-detailed. 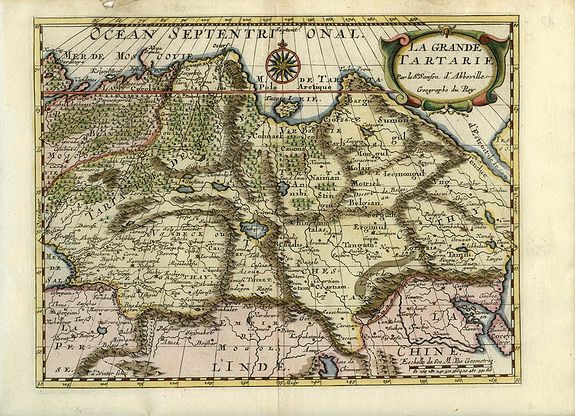 Siberia still reflects some of Ptolemy's conceptions with the Island of Tazata and the Cape of Tabin in the extreme north. The map is decorated with a lovely title cartouche as well as a beautiful compass rose. Engraved by Antoine d'Winter for a Dutch edition of Sanson's small atlas.